What is Stubbornness Costing You? Neil Schwartz has been in the real estate industry for over 30 years. He is the broker of Century 21 Masters, the #2 Century 21 office in the Nation. He blogs on neilschwartz.net, providing valuable information to agents regarding sales training, real estate marketing, social media, and technology. I was driving home from work the other night when a billboard caught my eye. 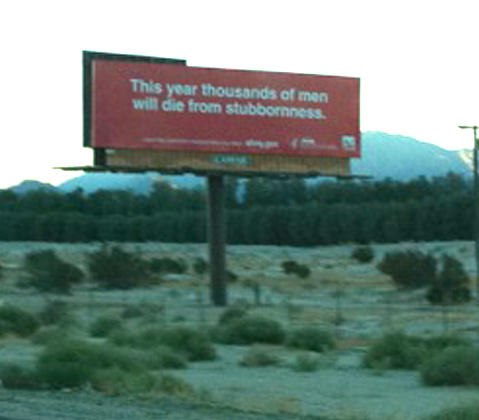 It said, “Thousands of men will die this year due to stubbornness.” The sign was referring to men who fail to seek medical attention for prostate cancer. It was a powerful campaign and it got me thinking about stubbornness. Beyond being stubborn about our medical health, I realized that stubbornness also prevents us from achieving our professional goals. This year, Thousands of real estate agents have and will fail to meet their goals due to stubbornness. What is Stubbornness and Where Does it Come From? Stubbornness is refusing to change one’s opinion or actions, despite attempts to persuade one to make changes that will benefit them. It is being bullheaded and resistant to a change in spite of a reasonable argument. Being stubborn is a behavior that often stems from either ignorance or laziness. It is one thing not to be knowledgeable, but if you have the information and chose not to change your behavior, well then, that is just being lazy. Knowledge is only as powerful as what you chose to do with it. We all know successful real estate professionals, coaches and brokers yet many of us fail to heed their advice regarding what activities we need to do on a regular basis to accomplish our goals. Why is that? Each of us should ask ourselves, “Am I as successful as I want to be?” Do I follow the advice of my broker, coach, mentor or high achieving agents? Am I seeing the professional results that I want? If the answer is no to these questions, then ask yourself, “Is that because I’m being stubborn?” Maybe it’s time to change your behavior. Stubbornness can have deadly consequences when dealing with health, and is costly to your professional success. If you think you may be stubborn, acknowledging it is the first step. Congratulations! Now, what changes should you make? Door knock, phone prospect, holds open houses, go to social events, advertise, use social media. Keep in mind that there are more people out there that don’t know you than do know you. Go find them! Call and email their leads on a consistent basis, don’t take “no” for an answer when “yes” is still a possibility. You don’t lose many deals from “over” following up but how many deals have you lost from not following up? Visit all of the properties for sale in their market. Knowledge =Confidence…When you know your market you will speak with confidence. Learn what to say and how to say it. Commit to a script, either write one yourself or use another that you’re comfortable with, and stick to it. Learn how to handle objections. Leads best respond to powerful presentations. Knowing not only your listing presentation but also how to handle objections is critical. Here’s a quick plan of action for you to supercharge your business in 2011. Visit or call 5 expireds daily and then door knock or call the 10 homes around each one. Preview 5 properties daily and door knock 10 homes around each one. Spend 30 minutes daily practicing your scripts and dialogues. Spend 1 hour daily doing intense phone follow up. Don’t let stubbornness hold you back from achieving the success you deserve. Stop being bullheaded and resistant to change. Learn from the actions of high achieving agents and incorporate it into your own businesses. Soon you will be joining their ranks! Let me know what you are going to do to beat stubbornness.